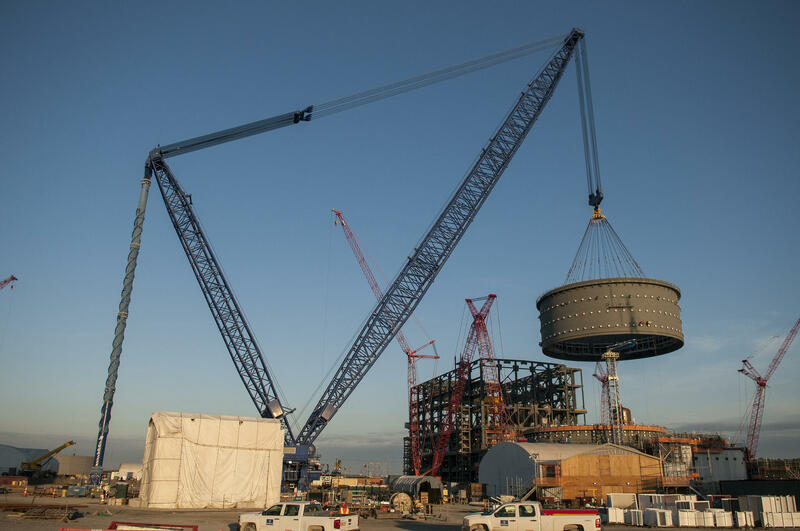 In early 2017, workers used a giant crane to lower a containment vessel ring into place at the V.C. Summer nuclear plant in Fairfield County, S.C. The plant's owners later canceled the project. Shareholders of SCANA voted Tuesday to sell the South Carolina utility to Virginia-based Dominion Energy, which has agreed to swallow billions of dollars in debt from the company's failed nuclear construction project and other operations. The deal gives Dominion — already one of the nation's largest utility companies — more of a foothold in South Carolina. The Richmond company already operates a pair of solar farms in the state, as well as gas pipelines purchased from SCANA in years past. SCANA is the parent of SCE&G and has about 1.6 million electric and natural gas residential and business accounts in the Carolinas. The combined company would operate in 18 states, providing energy to about 6.5 million regulated customer accounts. SCANA suddenly needed a buyer after it decided a year ago to abandon construction of two new reactors at V.C. Summer Nuclear Station in Fairfield County, S.C., northwest of Columbia. That was after spending $5 billion to plan and build the project. SCANA has been reeling since the debacle, which left thousands jobless. The project's co-owner, state-owned utility Santee Cooper, also has been wrestling with how to shoulder its stake in the failure. The failure spawned lawsuits from irate ratepayers alleging company officials knew the project was doomed, but lied about its viability. State and federal authorities are also investigating possible wrongdoing on behalf of top SCANA executives, some of whom have departed the company in the past year. State lawmakers wrestled with the fallout during this year's session, ultimately passing legislation to temporarily slash the percentage SCE&G customers pay toward the company's debt in the defunct project by 15 percent. The company has gone to court to stop that reduction — effective only through the end of this year — saying a 2007 law allowed it to charge for the project even though it never generated power. Dominion had warned it might pull the purchase offer if the rate cuts passed, later backing off those threats and expressing regret that a permanent rate solution hadn't been put into place. In the deal, Dominion is offering more than $1 billion in rebates to customers of SCANA subsidiary South Carolina Electric & Gas Co., as well as rate cuts of about 7 percent. The day the abandonment was announced, SCANA stock was trading just above $64 a share. In Tuesday morning trading, shares were listed at around $40. SCANA shareholders will receive 0.6690 shares of Dominion common stock for each share of SCANA under the stock deal. Dominion values its purchase at about $7.9 billion, with an additional $6.7 billion in assumed debt. Around 100 shareholders met in Columbia to approve the deal. If approved by regulators, SCANA becomes a wholly owned subsidiary of Dominion. The deal also anticipates the completion of the $180 million purchase of a 540-megawatt natural gas-fired power plant, a proposal announced by SCE&G President Keller Kissam in November. Dominion CEO Tom Farrell has previously described SCANA as a "natural fit" for Dominion. "This combination can open new expansion opportunities, including the Atlantic Coast Pipeline that is now under development, bringing lower-cost natural gas to the region," Farrell said earlier this year. Virginia's Dominion Energy said Wednesday it will buy embattled South Carolina electric utility SCANA for about $7.9 billion in stock. Dominion also will assume SCANA's debt, making the deal worth a total of $14.6 billion. Dominion also is offering to cut rates for customers of SCANA's South Carolina Electric & Gas subsidiary, and absorb other costs of a failed nuclear project north of Columbia. South Carolina Electric & Gas is offering to cut customer rates by 3.5 percent immediately, and more in the future, as part of a proposed settlement related to the cancellation of a failed nuclear project. A decade ago, nuclear power’s future looked bright. It offered a carbon-free energy alternative amid worries about greenhouse gases and climate change. But a lot has happened since then, like the 2011 meltdown at Fukushima and skyrocketing nuclear construction costs. 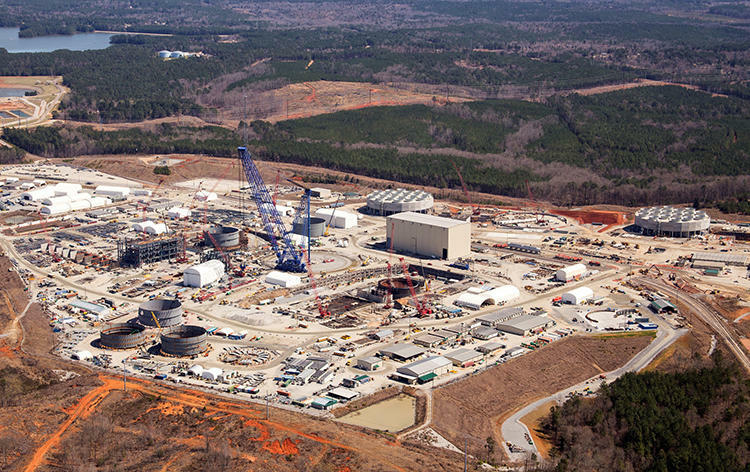 Last month, two South Carolina utilities scrapped a multi-billion dollar nuclear project. Now, the future of nuclear is even cloudier.